Below are some new earrings available in my shop for $85. These are one of a kind…I don’t have this design in any of my accounts! They measure 2 inches long and about 1/2 inch wide. 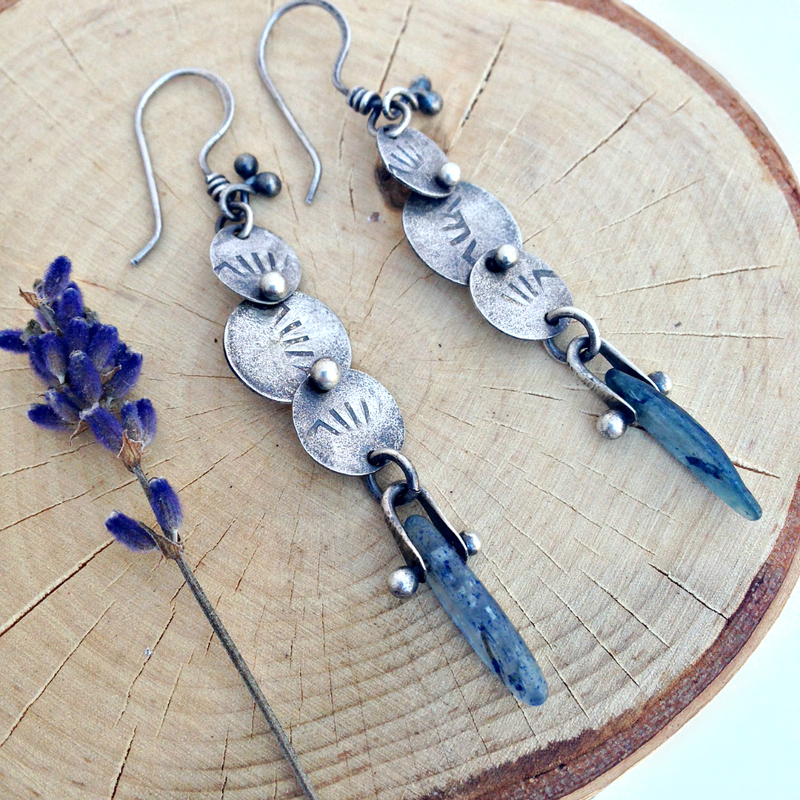 I usually make the triple disc earrings without the spears of kyanite, but a few days ago, I had the idea to combine these two elements of my work. I had a rough month…it looks like I have to have a hysterectomy in April. I am still in the investigative stage of this experience as well as just getting used to the idea. I will be home convalescing for about 6 weeks, and most likely won’t be doing much in the way of making jewelry. As far as everything else…I love my part-time job and the progress I am making in a completely different area of my life as it pertains to becoming a Human Design Analyst. I finished up my second series of pre-requisites for certification last week and will be taking my last pre-req class in September. Next year, I start my professional classes and am so excited about this new direction in my professional life. I am curious to see what emerges creatively in the next few weeks as I drill down and explore emotionally what it means to have my womb removed. Today, I found a bird’s nest that had been abandoned due to the cold weather snap we have experienced here, and I put it over on my oak tree stump that I have converted into an outdoor fairy house. It occurred to me that birds must build their womb…and when the conditions are not right, they abandon it. I guess the conditions are no longer right for me to retain my own womb. I am not sure how I feel about this on many levels. But I trust that it is all a part of the journey I am to take in this lifetime and that the deeper realizations and learnings will come in their own time. 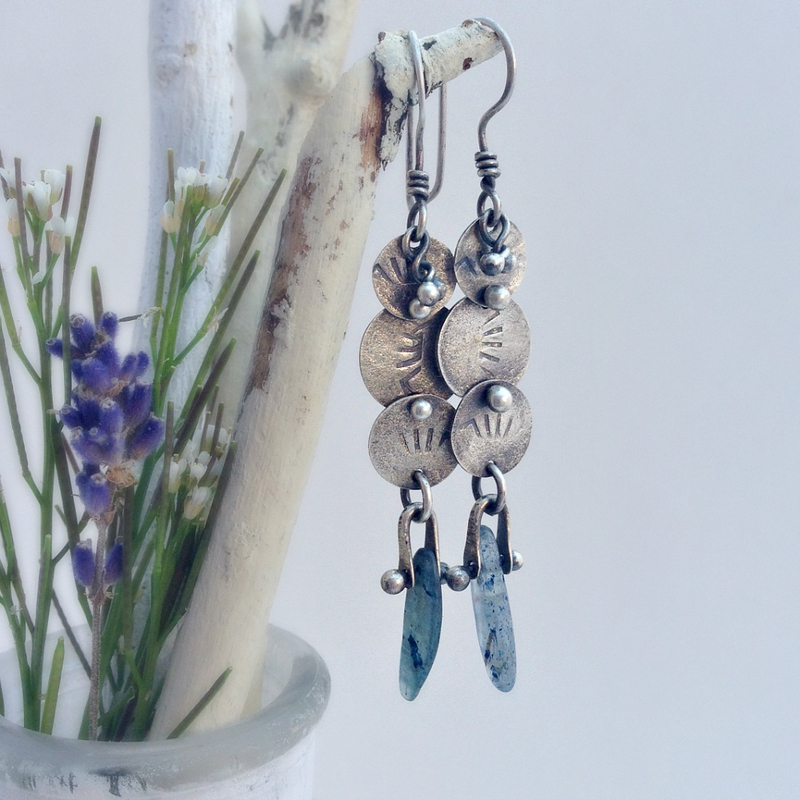 Kyanite is considered by some to be a healing stone, and a stone that helps those that wear it find their voice. Seems like this pair of earrings is a good start to this next leg in my journey. I am hoping via my creative energy to discover my voice regarding this monumental change for my body. Blessing to you…and thank you for reading. Hey there! I’m Stacie and welcome! 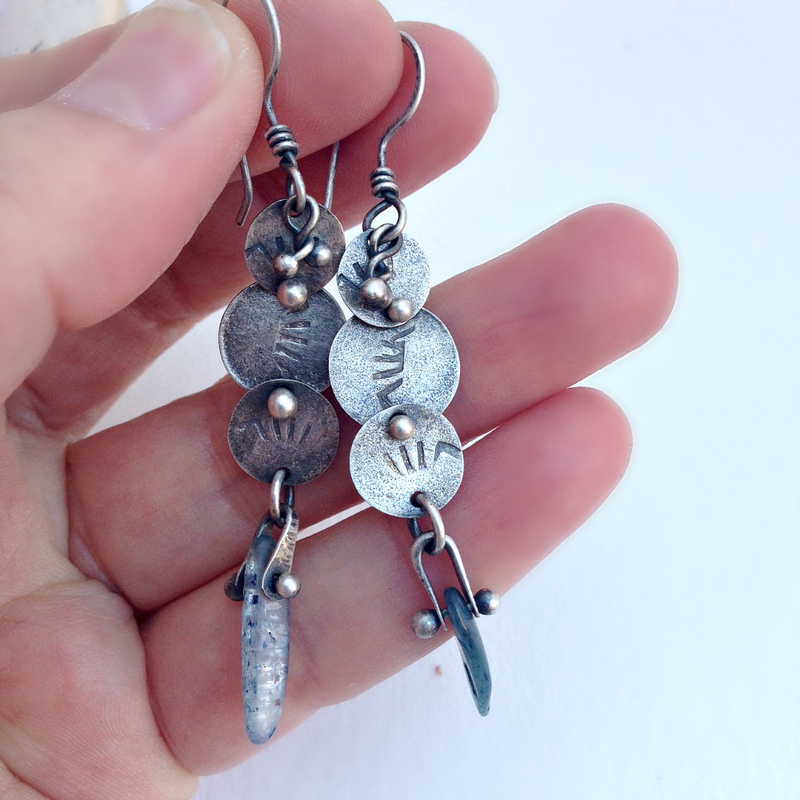 I am a busy creative that uses my studio time making jewelry to commune with All That Is. It’s necessary for me to express myself via my metalwork, and I share my working meditations with my customers that resonate with my jewelry. Thank you for stopping by! What I Write About Around Here.. The Rave BodyGraph™ and Rave Mandala™ are trademarks of the Jovian Archive Corporation.